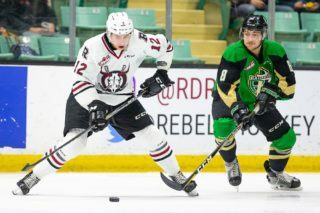 The Red Deer Rebels’ big line leaned on the Saskatoon Blades Tuesday night and helped the home side topple the visitors. Jeff de Wit scored twice, Brandon Hagel collected three assists to take over the WHL scoring lead and Oleg Zaytsev notched a goal as the Rebels edged the Blades 5-4 in a fast-paced, entertaining affair witnessed by 3,626 fans at the Centrium. “I felt good from the puck drop. 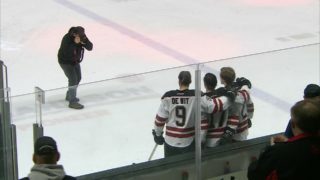 I felt my legs were there tonight, I was skating,” said de Wit, who potted his fourth and fifth goals of the season as Red Deer posted its fourth straight victory after a pair of season-opening losses. “But it sure helps when Hages is clicking like he is, and Zayts is playing well for a 17-year-old so it’s awesome. The game didn’t start well for the Rebels as the Blades opened with pair of power-play goals off the sticks of Eric Florchuk, who buried a rebound, and Josh Paterson, from a scramble. The second goal came with Hagel serving a kneeing penalty following an absolutely clean, open-ice, hip-to-hip hit on Kirby Dach. Chris Douglas beat Blades goalie Nolan Maier from the top of the left circle 46 seconds after Saskatoon’s second goal and, with Red Deer on the power play, de Wit scored on a deflection of Hagel’s shot from just inside the blueline. The Blades grabbed their last lead of the evening late in the opening frame when Kristian Roykas-Marthinsen beat Rebels netminder Ethan Anders low to the far corner from the left circle, just seconds after Red Deer forward Arshdeep Bains was knocked head-first into the boards without a call. But the Rebels shrugged off the adversity and scored three unanswered second-period goals to take control of the contest. “We got down tonight and didn’t let it get to us. We bounced back quick,” said de Wit, who pulled the Rebels even at 1:43 of the middle period on another deflection of a Hagel volley. Reese Johnson connected for the Rebels’ go-ahead goal just over two minutes later, jumping up into the play on a two-on-one break , taking a drop pass from Josh Tarzwell and beating Maier from the low slot. Zaytsev scored the eventual winner just past the midway mark of the period, burying a spin-around feed from Hagel with Blades defenceman Aidan De La Gorgendiere serving a tripping penalty. 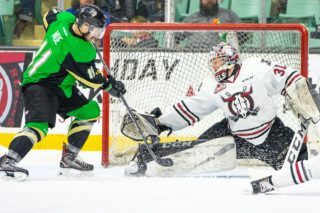 Riley McKay pulled the Blades to within one at 5:09 of the third period off a turnover in the Rebels end, but the visitors couldn’t find another goal. “We played hard, we competed. We were very competitive and we wanted to be that tonight,” said Sutter. And leading the way was the forward unit of Hagel, de Wit and Zaytsev. “It’s a good line, they have a little bit of everything on it,” said Sutter. “In the third maybe they over-handled the puck a little much on the power play, but five-on-five they were good. Anders recorded his third win of the season with a 29-save performance, perhaps his biggest coming on a close-in shot from Paterson late in the game. Maier made 30 saves for the Blades, including several of the difficult variety. “Andy had a couple bad bounces,” said Sutter. “On their second goal the puck bounced in front of him. But he’s a battler, he just stayed with it. He was like the rest of the group, they just continued to stay with the game. For a team that was supposed to struggle offensively this season, the Rebels are certainly turning some heads. “We’re all playing our roles pretty good right now. We’re going in with a little swagger with each game we play,” said de Wit. Notable: Hagel’s three helpers boosted his season total to a league-leading 13 point (3g,10a), while teammate Alex Alexeyev picked up two assists Tuesday to become the WHL’ top scoring defenceman with three goals and nine points. Rebels rearguard Dawson Barteaux was held pointless but is still second in scoring among defenceman with eight points (1g,7a) . . . Rebels blueliner Carson Sass sat out Tuesday with an upper-body injury suffered Sunday in Calgary. 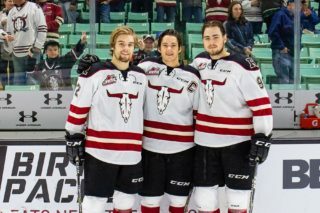 Hitmen forward Tristin Nielsen was assessed a boarding major on the play and has been served with a three-game suspension . . . 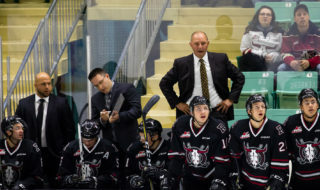 The Rebels are idle until Saturday, when they host the Prince Albert Raiders.